Instant Herbal Tea Made Easy! ActiveHerb™ single herb extracts are 100 grams extract granules prepared from single Chinese herbs at the concentration ratio of 5 to 1. ActiveHerb single herb extracts are produced in collaboration with one of the largest and best known pharmaceutical companies in China in its state-of-the-art cGMP-certified facility as a result of many years of research. Single raw Chinese herb is tested for authenticity, quality, and potency before a water extraction is made following traditional TCM methods. The extract liquid is concentrated at low temperature and then spray-dried to form extract granules. Our proprietary technology optimizes on the unique properties of each individual herb to maximize preservation of its active ingredients in full spectrum and guarantees quality consistency from batch to batch. To begin with, each herb needs to be properly identified by our professional staff using tools ranging from organoleptic, microscopy, to TLC. The quality of the herbs is assessed to make sure only the premium grade of herbs is used. This means the herbs are harvested at the right season and life cycle, and only the beneficial part of the herbs are collected. Whenever possible, we use herbs grown in our own GAP (Good Agriculture Practice) farms. As part of our GAP cultivation, we never use sulfur. Some Chinese herbs require being properly processed to maximize their therapeutic value. Processing is also required, at times, to eliminate toxicity. 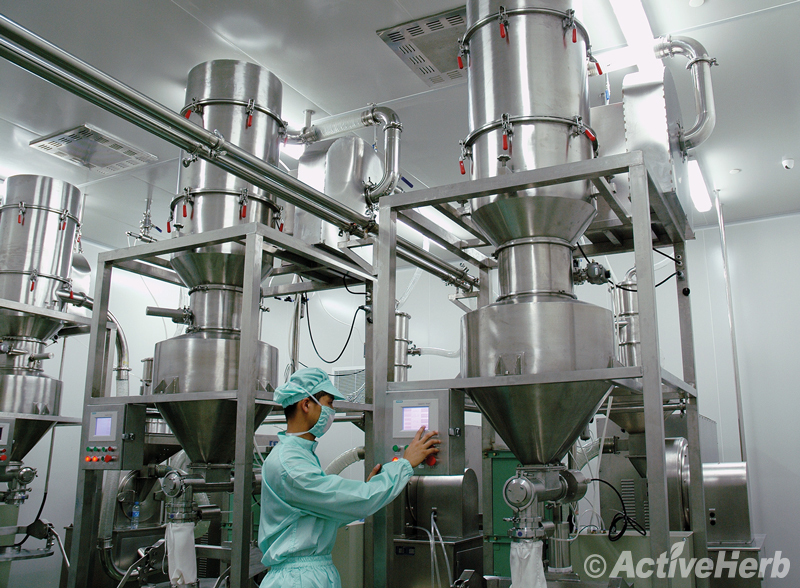 At ActiveHerb, we follow the most stringent protocols to process such herbs before extraction. Because each herb is different in terms of parts used—leaves, roots, flowers or fruits—, the density of the plant material, as well as active ingredients etc., it is necessary to adjust the time and the solvent volume used for soaking the herb before extraction. It’s also necessary to adjust the extracting temperature and duration in order to get the active ingredients out of the herb. Water is used as the main solvent in most TCM herbal extraction practices. However, in cases of active ingredients being more soluble in ethanol, ethanol is used instead. Moreover, if herbs contain essential oils, such oils are captured during extraction. After a lengthy period of trial and error, the best extracting protocol is established for each herb and forms the SOP (Standard Operating Procedure). After extraction, the extraction liquid is recovered, condensed, and further dried. Here, again, depending on the characteristic of each herb, different drying methods are applied such as low temperature vacuum drying or spray drying. In this step, a minimal amount of dextrin may be added to achieve the optimal 5:1 concentration, and to enhance the stability of finished products. In the final step, extracts in the solid form are granulated by a proprietary procedure so that our extract granules do not absorb moisture and stay separated. This is a distinct feature of our granules. No production is considered finished without QA tests of finished products. Each batch of our granules is tested for heavy metals and microbes, in addition to appearance and uniformity, moisture content, solubility, and other tests as applied. Only the finished batches that meet all the specifications are accepted. Our Certificate of Analysis, offered with each batch, attests to our commitment to product quality. In summary, our proprietary technology optimizes the unique properties of each individual herb to ensure preservation of its active ingredients in full spectrum and guarantees quality consistency from batch to batch. Why Do I choose ActiveHerb™ Single Herb Extracts? Use Instantly Take it whenever you need and wherever you go. No more cooking and mess. Custom formulation Make a custom formula that suits your individual needs by compounding multiple extracts in just minutes. Consistent and dependable results Our extract granules are consistent in quality and performance from batch to batch. No more worry about quality differences of bulk herbs from various harvests and sources. Potency Our extract granules are at 5:1 ratio. That means 5 grams of dried herbs makes 1 gram of granules. Liquid extracts or tinctures are at 1:2 tor 1:4 ratio, meaning 1 gram dried herbs yields 2 to 4 grams of liquid extracts, or even more diluted than that. ActiveHerb extracts are at least 10 times more potent than liquid herbal extracts. Potency Take it whenever you need and wherever you go. No more cooking and mess. Purity Our extract granules retain only the active ingredients extracted from the herb while the herb residue that counts for most of the dry weight is discarded. Optimal efficacy Our advanced extraction technology is not simply a cooking and spray-drying procedure. It is instead optimized for each individual herb on the basis of its unique property, and tested extensively to ensure preservation of active ingredients in full spectrum. This means you don’t have to worry about losing some of the benefits and actions of the herb. No Clumping No more wasting money throwing out unfinished bottles of clumped herbal ingredients! Safety Each batch of our extract granules are tested for heavy metals in accordance with the US Pharmacopeia. Value Our extracts are competitively priced even though they are superior in quality.